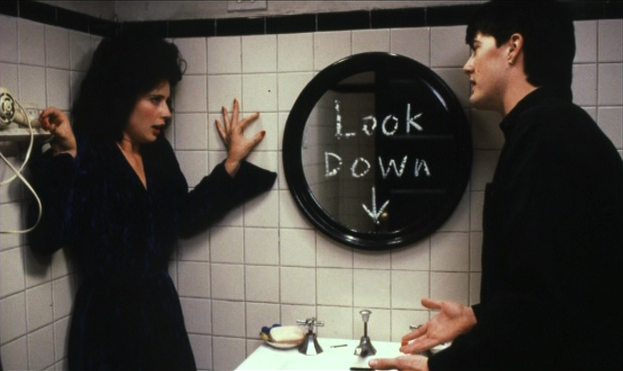 The first cut of Blue Velvet apparently ran a full four hours, but producer Dino DiLaurentiis had given Lynch complete freedom with one condition: it had to be under two hours. Sure enough, the final cut is precisely one frame shorter than 120 minutes! So how do you chop four hours down to two? Well, there are a lot of candidates for cutting here: odd cappers on scenes that feel creepy and unmotivated (“You know the chicken walk?”), long silences while Jeffrey watches things, the strange visit to Dean Stockwell’s house, generic montages of small town life, etc… The natural impulse would be to cut out everything but plot essentials until you have a lean, mean two-hour movie that “really moves”, as the critics say. But Lynch could tell the difference between the baby and the bathwater. He left the idiosyncrasies in and chopped huge chunks of the plot out. The result is that we never make much sense of what’s really going on, but that’s fine. Lynch knows that untidiness can increase the meaning and power of a movie. He could have said “Wait, if we don’t see them finding the second ear in the sink, then won’t it be confusing that Don is missing two ears when they find his body at the end?” And the answer is of course, “yes,” but it’s the right sort of gap: one we can fill in on our own if we care to (presumably the same people cut the second one off too, right?) but we don’t need to. It’s just another unexplained detail that make the world seem bigger than the movie, which is something the audience likes. Of course, even with the plot sliced way down, there was still more to cut, so Lynch’s decision to cut out many of Jeffrey’s early scenes was even more daring. We originally met Jeffrey at college, watching from afar as a girl is almost date-raped, and only stopping it when someone else approaches the scene. This clearly sets up his longstanding problem. Then there were a lot more scenes when he first arrives in town that showed his frustration with his mom and aunt, including one where his mom tells him that they won’t be able to afford college for him anymore, causing him to worry that there will be no outlet for his darker impulses at home. As I wrote about before, sometimes you have to write deleted scenes. Without those scenes on the page, the character would have seemed much less compelling until almost halfway in, but Lynch discovered he could cut them from the final movie because his amazing star, Kyle McLaughlin, managed to convey all of that deviance and frustration beneath the placid surface of his creepy/charming face. Just the curious way he looks at that ear basically tells us everything we need to know. This reminds me of a tip from the podcast Writing Excuses, where one of the authors said (I am paraphrasing poorly) "take one unimportant thing in your book and explain it in great detail and have one important thing that you don't explain at all," and that will make your book seem that much more full and real. That has always struck me as a great tip to get people thinking as they read, trying to make connections that may or may not be there.